Engineers at Massachusetts Institute of Technology in Cambridge and the 3-D printing company Stratasys Ltd. in Billerica, Massachusetts developed a process that translates complex computer-designed models into bone and related organic composite materials with 3-D printing. The team led by MIT engineering professor Markus Buehler published its findings online yesterday in the journal Advanced Functional Materials (paid subscription required). Bone is composed of materials that make it both rigid and flexible, to provide strength and resiliency to the human skeleton. These properties in bone are a result of the combination of stiffness in the calcium-based material hydroxyapatite, combined with the flexibility of the fibrous protein collagen. 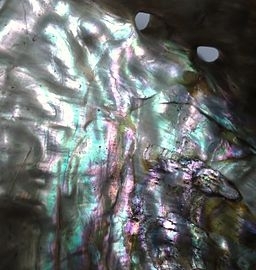 The same materials make up nacre, the material in the interior of abalone shells, also known as mother-of-pearl (pictured left). A continuing challenge in biomaterials design is translating those designs into actual samples, given the difficulty of emulating in the lab the natural electrochemical reactions in the self-assembly process. In their paper, Buehler’s team says they adapted 3-D printing to overcome this obstacle, simultaneously printing two polymers at once to produce five by seven inch samples, one-eighth of an inch thick, of each of the three designs. Tests of the samples showed the synthetic composite materials perform as predicted by the computer models, including one sample 22 times more fracture-resistant than the strongest original materials in the composite. Buehler notes that the process of designing and producing materials to meet performance specifications is as important or even more important than the new materials themselves. The implications of a design and production process to develop new materials that perform as needed goes beyond biological applications. Buehler believes the lab process reported in the paper can be scaled up for many other kinds of materials made of two or more ingredients, and configured to exhibit desired properties. On a large scale, says Buehler, the concept can be extended even to entire buidlings, built by printing materials incorporating functions such as plumbing, electrical circuits, and energy harvesting.